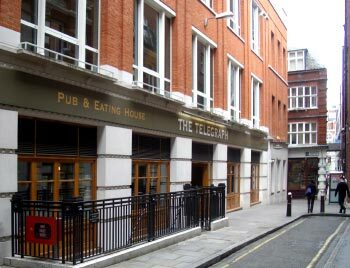 Just about halfway along Moorgate Street on the eastern side and directly opposite Great Bell Alley you will find Telegraph Street and the Fullers pub, The Telegraph. This modern pub located in the southern end of Northgate House offers a traditional pub feel, with Fullers beer and the fine dining experience. The kitchen is open and chiefs can be seen hard during lunchtime services. Telegraph Street was the site of the GPO's Central Telegraph Office which opened in 1840, the company managing to persuade the City Corporation, to rename the alley, Telegraph Street; so that its formal headquarters’ address became 12 – 14 Telegraph Street. The telegraph lines where moved in the late 1900's to the new GPO headquarters in St. Martin’s-le-Grand. Work on moving the lines commenced on the afternoon of Saturday, January 17, 1874 and all the 500 circuits had been transferred by three o’clock on Sunday afternoon without the interruption of a single line of communication or the suspension of a single message.